When it comes to vegan infants and toddlers, every runny nose is scrutinized. Many people believe that little ones require animal products to grow and develop properly. 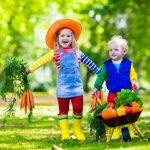 If an infant or toddler fails to thrive on a vegan diet, health practitioners, family and friends are quick to say, “I told you so.” If you are a vegan parent, the following tips will help to ensure that your toddler grows to be a healthy, happy child. Ensure sufficient calories. Vegan diets are often high in bulk and low in fat. While this is great for disease prevention, it may not promote optimal growth and development. This does not mean vegan diets are inappropriate for infants and toddlers. It simply means that when constructing a vegan diet for young children, growth and development must be priority number one, and the caloric density of the diet must be high. Provide three meals per day plus snacks between meals. Limit fluids with meals (can be filling). Add calories where possible (e.g., add sauces to vegetables, nut butters or avocados to smoothies, extra spreads on bread, etc.). Aim for 40 to 50 percent of calories from fat. Tofu – this is an ideal food for small children – packed with protein and fat (plus other nutrients), but low in fiber. Use it in shakes, scrambles, sandwiches, soups, stews, roasts, loaves, patties and desserts. Fortified, full fat soymilk – use fortified soymilk as a beverage and in food preparation. Aim for at least 20 oz. fortified soymilk per day. toast, in sauces and puddings. Avocados – these little gems are loaded with fat, calories and nutrients. Add them to salads, puddings, dips, spreads and toppings. Fiber fills the stomach and can reduce total caloric intake. Avoid concentrated fiber like wheat bran in the diet. Use some refined grains to produce weight gain (sufficient fiber will come from other plant foods). Whole grains should be included to increase intake of vitamins and minerals. Provide at least 25 grams protein per day. Insufficient protein can compromise growth. Soymilk (20 oz.) will provide about 15 grams of protein. One veggie deli slice has 4 to 5 grams, and 1/4 cup tofu has 8 to 10 grams. Even a slice of bread has 2 to 3 grams of protein. Thus, ensuring sufficient protein is not difficult if caloric intake is adequate. Be aware of the needs for iron and zinc. These nutrients are very important for growth and development. Iron is the most common nutritional deficiency in infants. Iron-fortified infant cereal, legumes, tofu, nuts, seeds and dried fruits are all good sources. A lack of zinc can mean poor growth and reduced immunity for children. Good sources include legumes, nuts and seeds. Include a multi-vitamin/mineral zinc supplement that provides 5 to 10 mg. of zinc. Don’t forget the Vitamin B12! There are no reliable plant sources of vitamin B12. Use a supplement or fortified foods (at least 1 mcg./day). A lack of vitamin B12 can result in muscle wasting, weakness and irreversible nerve and brain damage. Include sufficient calcium and vitamin D.
Calcium and vitamin D are necessary for strong, growing bones. Both of these nutrients can be provided in fortified non-dairy milks and other fortified foods. Other good sources of calcium are dark greens (excluding spinach, beet greens and Swiss chard), tofu made with calcium, almonds, legumes and figs. This recipe was created by EarthSave International’s Chair of the Board of Directors, Louisville Lawyer and amazing chef, John Borders. Set your little companion up on a stool beside you, ready to toss in the ingredients and push the button. Place all the ingredients in a food processor or blender. This works best in a food processor; you might add a bit more juice or soymilk if you use a blender. Blend until smooth. Per serving: 336 calories, 7 g protein, 40 g carbohydrate, 19 g fat. 100 percent of the requirement for magnesium, folate, vitamin C and omega-3 fatty acids. Adapted From: Becoming Vegan (Davis and Melina, The Book Publishing Co. Summertown Tennessee, 2000).